White gold Celtic earrings are stunning 14K Trinity knot studs that are set with 1/4 caret diamonds. These 14K white gold Celtic earrings are Trinity knot studs that have been set with 48 individually set round brilliant cut diamonds with a clarity grade of SI 1-2, and rate G - H on the color scale, for a total diamond weight of 0.25ct (1/4ct.). The gold Celtic earrings measure 3/8” wide x 3/8" tall and are made by Solvar Jewelry in Dublin, Ireland. The diamond Trinity earrings are gift boxed with a Celtic knot history card, complements of The Irish Gift House. Celtic necklace is a white gold Trinity knot that is enhanced with over 1/2 caret of diamonds. Celtic necklace in stunning 18K white gold design that features a diamond studded Trinity knot. Celtic necklace is a 14K white gold design that features diamonds set in the Trinity knot along with in the omega chain. 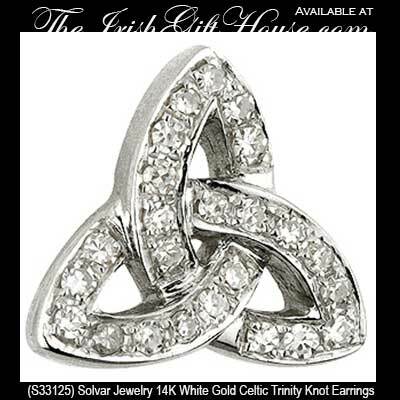 White gold Celtic necklace is a classic Trinity knot that is studded with diamonds.